﻿ Central Mutual Insurance Antique Fire Equipment Museum - Ohio. Find It Here. During the 1800s, in rural midwestern towns like Van Wert buying fire insurance was a difficult and costly proposition. Building construction was primarily wood and there was little, if any, organized protection against fire. The "Van Wert County Mutual Fire Insurance Company" was formed to fill that need. The threat of disastrous fire was always very real in rural communities and the equipment used to fight fires was primitive. 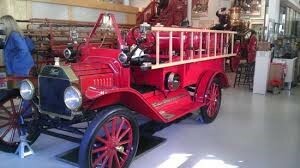 Centrals Fire Museum is one of the finest privately held collections in the United States. The home office of CentralMutual Insurance has recently undergone a $4 million expansion/renovation project that included a new home for the museum. During your visit you will see:* A collection of leather fire buckets dating back to the 1700s. *Over 600 antique fire toys*A large display of fire extinguishers and glass fire "grenades" dating from the 1850s*A rare and valuable collection of "firemarks" dating back to 1720*A wardrobe of antique fireman helmets and uniforms*Van Wert's first hand-drawn pumper used in 1871, and an Ahren's horse- drawn steam pump which was purchased in 1907 *and much more.